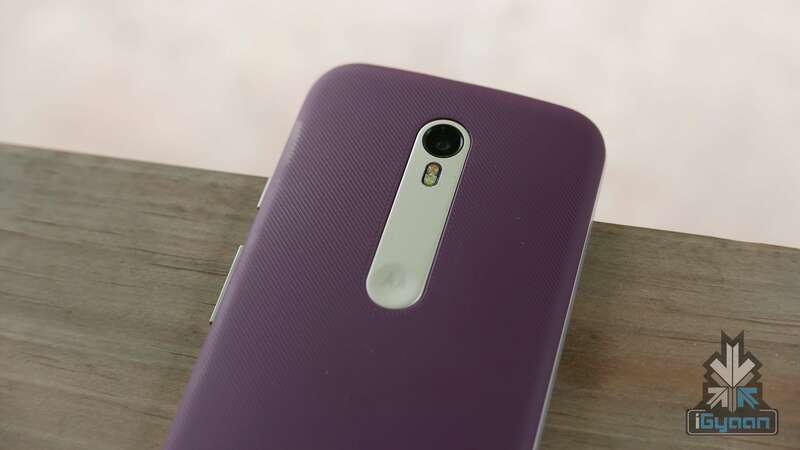 The new Moto G for 2015 is the hero for Motorola. 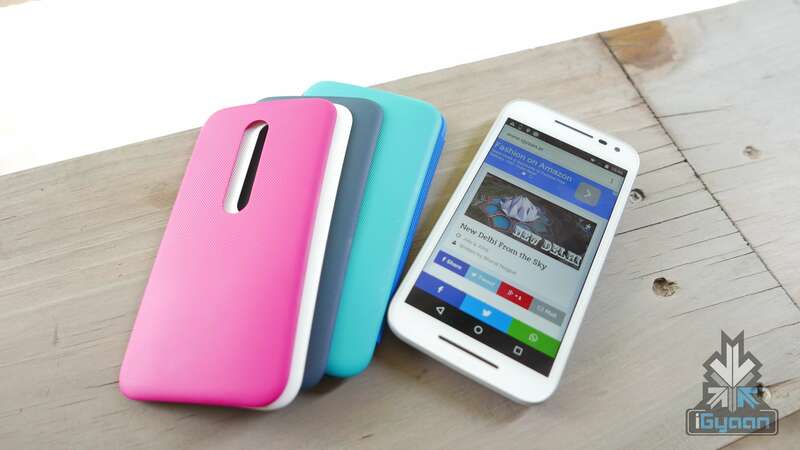 With a whole spew of upgrades, the new Moto G is ready to take on the market. With little change in design and price, the customer is left asking for a lot more. 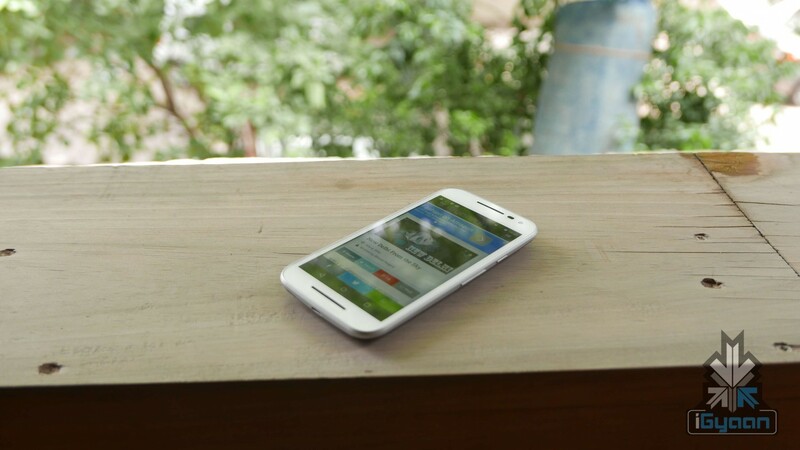 The new Moto G is available in two variants; a cheaper one priced at Rs. 11,999 comes with 8GB storage and 1 GB of RAM, whereas, a slightly expensive one at Rs 12,999 comes with 16 GB of storage and 2 GB of RAM. You also have a whole variety of covers that you can buy and swap with your current cover. 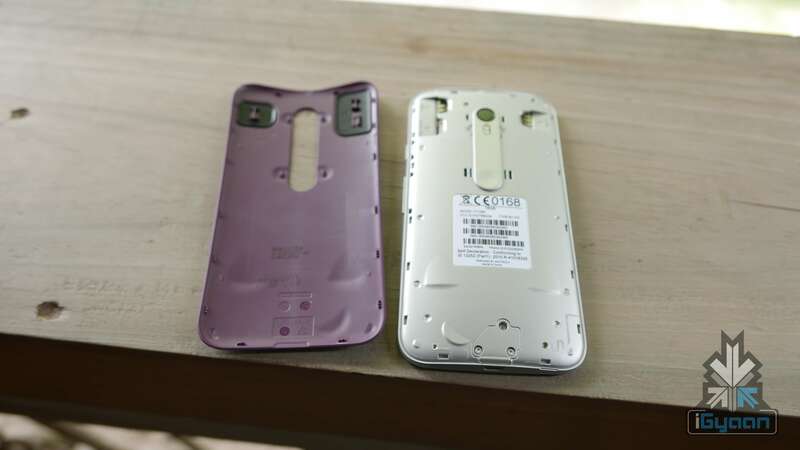 Design wise you have a whole lot of differences starting with the back of the new Moto G, all the way to the front. It’s more rounded and has silver accents, which add to the premium look and feel of the device. The long cut in the back panel houses the camera equipment and the panel has a new reassuring texture. Build is superior when compared to the last gen of the Moto G. With the IPX7 rating, the new Moto G can also withstand 3 ft (1 M) of water immersion. This makes the phone one of kind in this price bracket and also the second device only after the Apple Watch to have this rating. The plastic shells are high quality and swappable, which mean you can easily replace the back if damaged. The new Moto G also has Gorilla glass and a new solid structured frame that makes it a big winner in the build department. 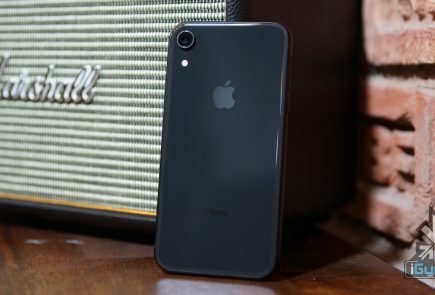 No hardware does not get a big boost, but you do get an improved camera, a slightly faster and more stable chipset and that is just about it. USB On the go is easily available, you also have micro SD card slots for expandability and two hardware options; 1 GB RAM + 8 GB Storage or 2 GB RAM + 16 GB Storage both of which support expandability and are separated only by a Rs. 1000 price difference. The Moto G Gen 3 is more of a balanced smartphone. 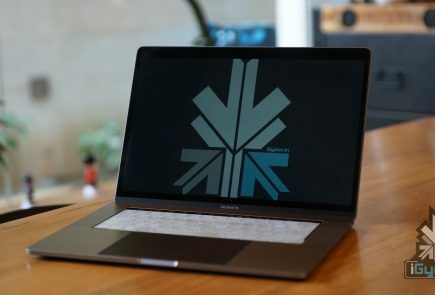 You won’t get a performance monster and you shouldn’t expect it to be one especially with the specifications it is packing. The 2 GB version, only slightly more expensive performs far better than the 1 GB variant. It will also bump up the onboard storage to 16 GB which would only make sense. The User interface is fast and smooth and the stock Android helps with that to a big extent. The GPU handles multitasking and gaming with ease, although some applications tend to lag with the 1 GB variant. The 2 GB will work well for day to day usage and also with gaming. Games work well with the 2 GB variant, as mentioned earlier. If you choose to run your games (like Asphalt 8) with higher graphics you will face some lag, mainly due to the limitations of graphics processing. The 13 MP main camera is a big improvement, mix it up with the Android 5.1 camera capabilities and you get a great camera experience. Manually set up focus and exposure before you click the picture. The camera focuses quickly so you can go up close with your subjects and get a good depth of field. Images tend to be sharp and autofocus is snappy. Its a pity that the Moto G misses a proper oleophobic display, which would allow you to use the phone under water. No, you don’t have an underwater camera with the new Moto G.
No image stabalization also means that shaky hands need to beware of the induced camera shake. Video stays at 1080p and you also get some high speed capture at 720p reducing speeds to half, if needed. The speaker is forward facing and has good audio. Despite the dual grills there is only a mono speaker. We would have liked a louder speaker, or at least a stereo speaker combo. The forward facing speaker makes the audio experience while watching video or playing games, improved. The display is still a 1280 x 720p panel but is extremely vivid and bright. Outdoor visibility could have been better, but is very usable. The display has good viewing angles and the colours pop, so you won’t find us complaining. We did want a 1080p display and since most of the competition does offer up a 1080p display in this segment, it became a let down for us. 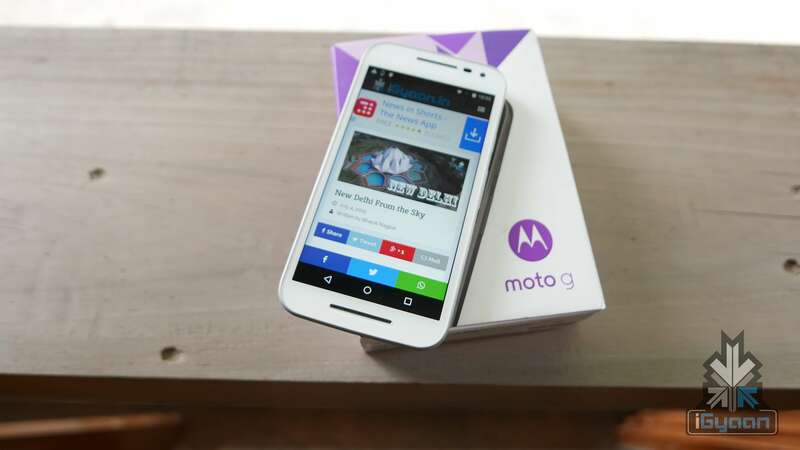 With the inclusion of 4G networks, the Moto G adds the list of network ready phones. A major deal of Androids will join this list by the end of the year as most network players will offer 4G services. The network performance is good and the audio quality is excellent. The connection strength is a big improvement over the last gen. phone. With the IPX7 rating, the one thing we really wanted to check was underwater calling capability. The phone does ring, but making a call is practically impossible as the display goes crazy with electric conduction the minute you unlock the screen, so your phone will randomly jump from app to app. We don’t really want to be making calls underwater, but hey, it could come in handy. We are getting mixed reports about the battery life, some users are complaining of battery drain and others of overheating issues. However, we faced no such issues, and the phone gave us 1+ day of average use. We are expecting 4-5 hours of talk time mixed with varied use. Charge the Moto G once a day and you are good to go. 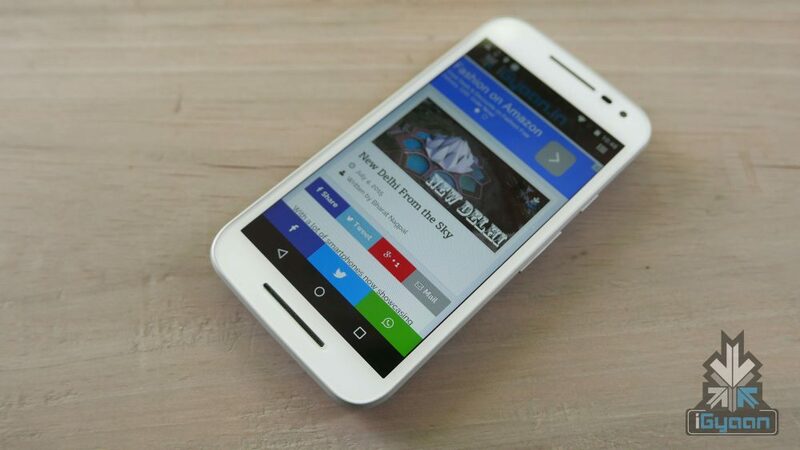 The Moto G (3rd Gen) is a smart upgrade from a good company. 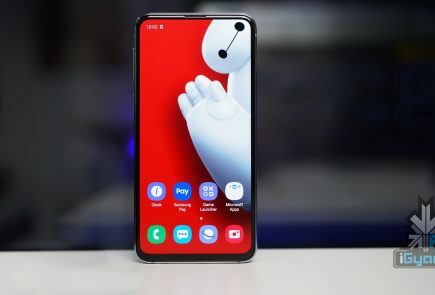 They did miss out on a few key things, a better display and a better chipset would make this the best phone for the price. However, it is a smart choice. It has the trust of a motorola handset, and the added legacy of great phones like the Moto Defy. Also the IPX7 rating, makes it the only phone in this class, with any such rating. It will be useful for those who need it. Lastly, the swappable colour covers make sense and add personal style. Availability is easy, no flash sales and no invites. 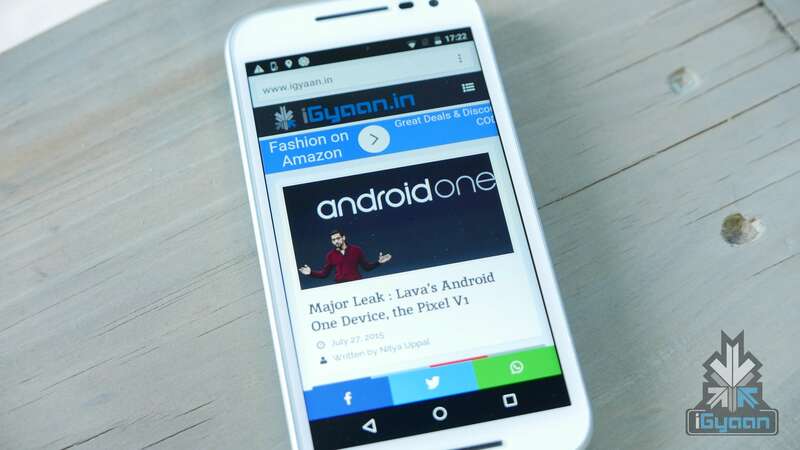 Smartphones need to be easy to buy and readily available in 2015, and the new Moto G ticks all the boxes of being a well rounded phone. Sir,i have this phone and i feel the display colors little warmer compared to First Gen..or its just a problem with my unit? What about the service of motorola? 16GB/2GB US version is not available yet. Please iska experience krna boss…. Hey, as you’re done with the review.. Can I get the Cabernet back cover for it? I cannot pay the full 999 as they’ve asked on flipkart, so thought as you’ve got a lot of covers, if you’d be willing to give me one?